(I’ve always wanted to know what it was like to engage in the online paper writing business. Not because I couldn’t write my own papers, but because I wanted to see what kind of students paid for papers and what they expected. 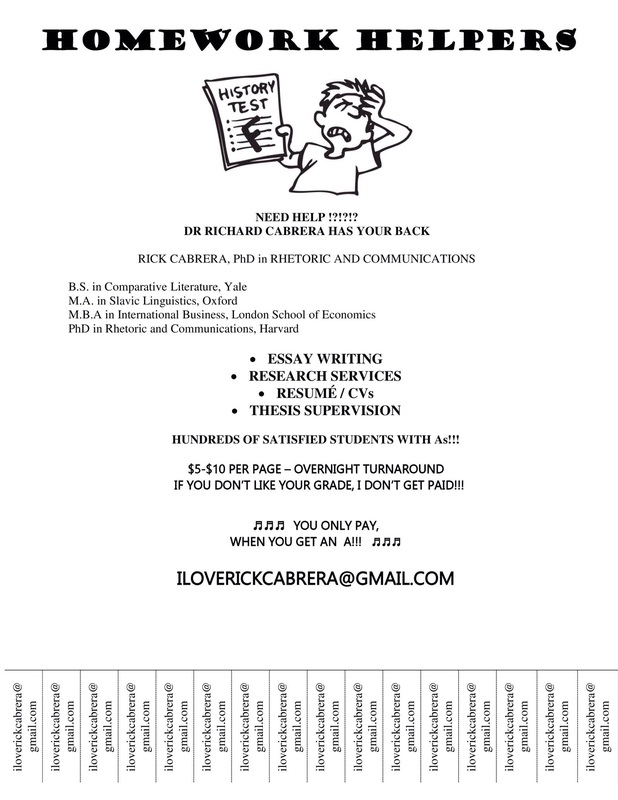 So I decided to put myself on the other side of things and offer my services, by posting flyers around the UT-Austin campus, as an alleged ex-professor with degrees from Yale, Oxford, The London School of Economics, and Harvard. The fact that students would believe that someone with these credentials would be writing Intro to Lit papers for 19 year-olds at $5 a page is bananas, but some bit. And I gave them papers, filled with major gobbledygook, as well as high-level literary theory (which is primarily gobbledygook itself, but I’m somewhat versed in it). Their professors will either know they didn’t write the papers or just think they are nuts who have violently misunderstood the theory that they’ve been exposed to. Either way, the students got what they deserved for cheating. And to think, I used to fashion myself as a safety net for academic slackers. I might still be at heart, but the pleasure and humor I get from writing these far outweighs my principles. More of these will hopefully be on the way. Exam time is coming up). I saw your flyer in jester at UT. Are you doing the writing assignment? I can do a writing assignment. What do you need? Read: pp. 480-500–Malory and from Morte de Arthur. First major essay. Write an 850 word essay in which you read the following material and discuss the following topic. Please read, “Creating the Myth” by Linda Seger, linked in Pages. before you get started. It will help with the hero’s journey. Referencing four works we’ve read including Beowulf, Morte de Arthur and Sir Gawain and the Green Knight and the editors’ introductory materials for each work and writer (including their discussions of classical heroes from The Odyssey and other tales), compare and contrast the hero and the hero myth as read in those works. You should consider the Great Chain of Being (See and go over Tillyard link in Page) and genres of the epic and the romance, as well as pagan elements and Christian elements, in your discussion. Use MLA manuscript format, MLA in-text citation style, and MLA Works Cited. You got it. Will be done soon. When do you need it by? Thanks. It is due Feb 23! $5 a page, only if you get an A. Otherwise, I didn’t do my job correctly. And I always do my job correctly. And Feb 23 is an easy date to cover it by. Thanks. The assignment is not due until 23rd but can I have it by 20th? Yeah. Working on it. No problem. Coming along. Like conjoined baby twins, the hero and mythology suckle at the teet of humanity as aberrant creations of a lonely literary God. They cannot be separated without the splitting of one of their souls into a gang-bang of good vs. evil. French theorist and jaywalker Roland Barthes argues that mythologies are made out of images of mass consumption. Heroes are created to be consumed, like Afghan poppy seeds on a cold winter night. Deleuze and Guattari, in their great works on schizo-analysis, rip to shreds the concept of the contained self, and therefore the “hero,” arguing that “persons” are interactive multiplicities of physical, semiotic, conceptual, affective, libidinous, etc. strata. From this perspective, there are no “heroes” as in centered subjects, but rather deluded “hero mythologies” projected from the brains of posthumanoid, cognitively extended, Fahrendaseingeist. Books with heroes are petrified bunkum. Jacques Derrida once claimed that all texts are self-consuming, auto-masticulating serieses of words, hiding their own destruction within the bowels of their apparent logic. Therefore, by way of syllogistic reasoning, we can conclude that heroes are merely the fantasmagoria of an opioididated cultural machinery hell-bent on teleologically destroying itself, circling in on itself, as it consumes its own children. This Circle was once an orb, as German philosopher Peter Sloterdijk claims in his masterful trilogy Spharen, that emanated from the restrictions of an arborescent epistemic structure, delimiting all typologies according to the logic of totally totemic reasoning, one that is violently pre-Darwinesque in its hierarchy, or “Chain,” that encompasses all of metaphysics. Once the birth of Biology at the beginning of the 19th century, as Foucault argues, emerged, the Great Chain of Being was blastified into anonymous bio-randomenic patterns.This marked the devolution from a heart-felt Christian truth into a mud-filled barrel of salamandric simulacra, a metamorphosis into a meatless meta-mirror, with no beginning or end. The Hero was no longer on a fifth-dimensional plane, sending dangerous gravitons towards its biologic property. He was chewed up and regurgitated as a member of the cosmic catastrophe that we call life. In The Odyssey, Joyce’s self-referential literary humiliations signal the release of these libidinous tensions. He writes the Hero as the Everyman, caught up in a mythological reenactment or simulation of a myth. Bloom is simulationalizing the writing itself, reaching through the text, as a character simulating and effecting, made of myth and the narrative recursivity vis a vis material agency. Joyce is his own uncle. From a Lacanian standpoint, he is a hero model and the hero, embodied and interactive, made purely of slippery textual fragments. And The Odyssey expresses this intersection through the mockery of those meta-physico-textual that populate our world as real simulations. Joyce destroys the Hero by destroying writing itself, making every word a mockery of the flighty pretensions of “authors” or Arthurs. This brings us to Morte de Arthur, a scandalous tome in the vein of Fifty Shades of Grey and Proust’s Remembrance of Things Past (only the first two books, who can read all 3500 pages?). Arthur is a hero-myth, a self-delusory character in a book about a book. It is advisable not to believe in him nor his teachings. He fashions himself his own father, bringer of bacon. But any discerning reader can tell that this flight of fancy is impossible. Christ once said that “a father is a real simulation, a simulation, but with real effects.” I feel this way about my own father, a breathing dead man(simulation) walking down a path to my bedroom with his spurs clanging and a belt in his hand(real effects). Beowulf, in the 3D version of the movie, pops out atch’ya, breathing fur down your neck and into your pituitary gland. Great action, but mythological in structure as well. He’s not like the wolves in True Blood or Twilight. I believe in wolves, just not ones that cantankerously attack women and children for their own polymorphically-perverse gratification. Sir Gaiwan and the the Green Monster (five stars for this masterpiece!) is pretty good. I liked its flavor for hypocrisy and hegemony. It was both epic and romantic. Epically romantic. An epic romance (or bromance: you gotta be PC) has the flavor of truth because the romance genre uses tropes that copulate: realism and fantasy. These two remain in a productively hermeneutic feed-foward loop intertextually and extra-textually. The economy of mythopoetic desire runs through the pages of both book and brain. This is not to be confused with the romantic epic, where goddesses thread the foreskins of men with the rose stems that populate the left leg of Artemis. That’s all I have to say about that. Deleuze, Gilles and Felix Guattari. A Thousand Plateaus. Joyce, James. The Odyssey. 1922. Sir Gaiwan and the Green Monster. Author unknown. Morte de Arthur. Author unknown. I couldn’t add it as an attachment, so just cut and paste. Get ready for your A! Did you use too much graduate student level of writing..? Nah. This is how I wrote when I was an undergraduate, and look at my CV. Your professor will be impressed by the added sources and the level of literary abstraction. I know, I used to teach at UC Berkeley, which has students of comparable intelligence to that of UT Austin. It’ll work. This first one is pro bono. Your professor won’t think it’s too good later when you keep turning in work of this quality. They’ll just think you’re a bright student who ended up taking online courses at Midland college. And since the course is online, any questions or concerns he has can be redirected to me and I’ll explain them to him, pretending to be you. Easy. I was a professor for years and I know this will work. Hello…. I am wondering you edit paper as well… and if the rate is the same..? From now on, I would like to write and ask you to edit my paper and point out what I need to add or subtract..